I know y'all will have a football delay---could we make it three hours?? Not only will I have to watch on PST--we're having friends over for dinner so lord knows when I can watch! Yeah, I feel terrible for Peach . Off to join party with Michael . Then its time until next week where we will feel like . puddin -- you better not pull any RFF Game shenanigans this week. puddin you look great today! Heading home tomorrow so I'll have almost three weeks Michael! And you do too know my name! And mswood--I love it out here but this watching 3 hours behind everyone else is for the birds! I don't know how you all manage it every week! Don't you have to make room in your happy place or something? .and I will find a way to deduct points from you Michael if you give away the end with such things as "yay"
At 7pm the Chiefs tied the Jets at 10-10 with 3 minutes to play in regulation. It looks like Overtime for those in the Jets/Chiefs viewing area (this includes the New York and Kansas City areas for sure). If this game does not go to overtime it will be over around 715pm, but CBS might then go to another game. LOL last week all I posted was "wait until you guys see the end!" what time is the show going to start for you guys? I have the PIT 21/Baltimore 27 game, 4th 2:04 left. When I found this picture on or about Aug 1st? The first thing I imagined was that it would be an intro flash and it was, the next thing I imagined was Yogi being a greeter. I hope he speaks, I feel up close and personal with Yogi or is it Yogi's? I hope the racers have to shake his feet! ...could be worse, puddin. He could be a "Swami". The Jets kick a 43 yard field goal and win 13-10. 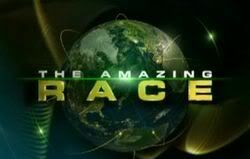 The estimated start time for 60 Minutes is about 740pm and for Amazing Race is 840pm. oh my god I have to wait until 9 40 to talk about it?! CBS official start time, 8:39 p.m.